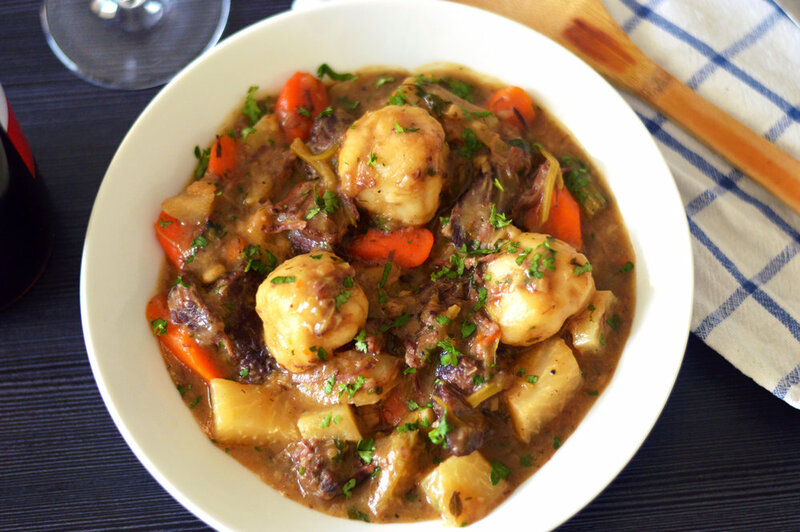 In a large saucepan over a medium heat sauté the onions, celery and turnips for 8-10 minutes, until soften. Add the garlic and sauté for an additional minute. Turn up the heat and quickly add the beef and flour, season with salt and pepper. Once the beef has been seared add the red wine and deglaze the pan (scrape any brown bits stuck to the bottom of the pan). Once the wine has nearly evaporated add the beef stock and 1 litre of water and bring to the boil, mixing slowly with a wooden spoon. Next turn down the heat to low and add your balsamic vinegar, swede, parsley stalks and mix. Next add the fresh thyme and bay leaves and leave to simmer for about 2 1/2hours. Check and stir once every 15-30 minutes and add water if needed (try to leave the fresh thyme and bay leaves at the top, to make it easier to remove later). Meanwhile start making the dumplings by sifting the flour and baking powder into a mixing bowl, add suet and salt and mix well. Next add 3 tbsp of water and stir. If the dough is to dry keep adding a tbsp of water until you have a slight soft sticky dough. With floured hands, roll small balls of dough roughly into 30g balls. Wrap in cling film and leave on the side. 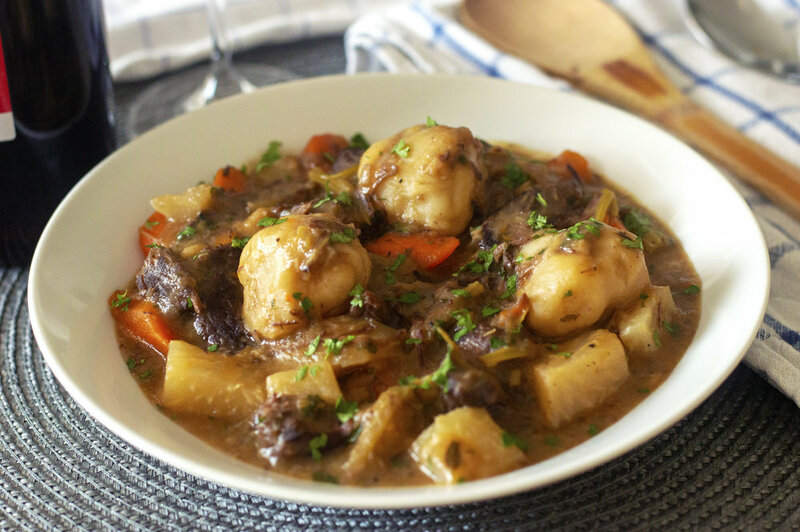 After the stew has been simmering for 2 1/2 hours add the carrots and dumplings then cover the saucepan with a lid and simmer for an additional 30-45 minutes, until the beef is tender and the dumplings are cooked. Turn off the heat and remove the fresh thyme stalks and bay leaves from the stew, add the parsley leaves and mix. Season the taste with salt and pepper and serve fresh from the pan with an extra sprinkle of parsley.